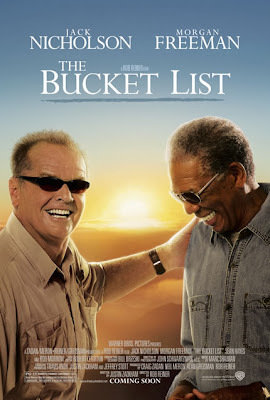 From the Front Row is proud to announce its latest contest in conjunction with Warner Brothers Pictures for their new film The Bucket List (12/25), starring Jack Nicholson and Morgan Freeman, and directed by Rob Reiner. To enter, send in your own "bucket list," that is a list of things you want to do before you "kick the bucket," to contests.fromthefrontrow@gmail.com. Prizes will be award to the top three most interesting or creative lists. Winners will receive a copy of the film's official one-sheet poster (pictured above) from Warner Bros. The contest ends on December 31...winners will be announced shortly thereafter. most people don't even begin to think along these lines unfortunately or they'd might live their lives more fulfillingly..or not.It;s never too late to dream never to too late to begin work towards that dream..only when you give up,that;s when you really die, long before the physical reality kicks in...enjoy "your" life !!! Happy New Year 2008 everyone!!! I do not like to think about it.